Dhaka, Bangladesh (BBN) – The central bank of Bangladesh has accorded reception to the 150 volunteers who helped rescue the victims of Rana Plaza building collapse in Savar on 24 April this year. The Bangladesh Bank (BB) organised the reception at its training academy in Mirpur on Saturday where the volunteers were rewarded with honorary certificates and a check of taka 5,000 each. 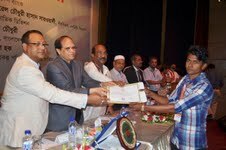 Addressing the programme, BB Governor Atiur Rahman urged the banks and financial institutions to offer jobs to the unemployed volunteers. The governor said the volunteers deserve proper reward as they have set an example of humanity by participating in the rescue operation at Rana Plaza. General Officer Commanding (GOC) of Bangladesh Army's Ninth Infantry Division Major General Chowdhury Hasan Suhrawardy, Bir Bikram, attended the programme as the special guest. The rescue operation at Rana Plaza was carried out under his supervision. Praising the volunteers, he said the people who rushed to Rana Plaza to participate in the rescue operations were the people that included students, day labourers, rickshaw-pullers and vegetable vendors. He said the volunteers and the family members of the Rana Plaza victims should be given more social and financial supports. BB Deputy Governor SK Sur Chowdhury and Joint Secretary and Project Director at the Directorate of Fire Service and Civil Defence Ataul Haque also addressed the programme.